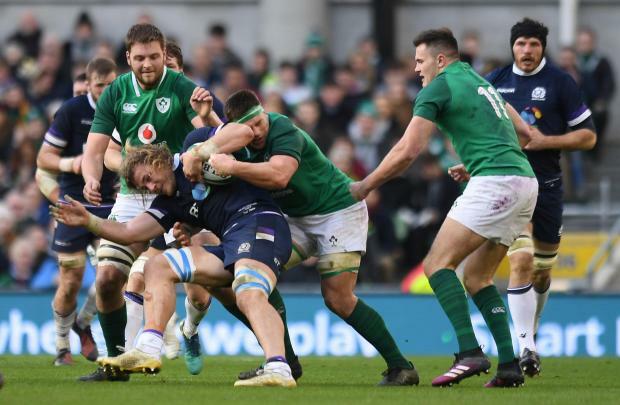 Ireland piled enormous pressure on England as winger Jacob Stockdale scored two tries in a 28-8 defeat of Scotland in the Six Nations in Dublin on Saturday. Scotland matched their hosts for much of the first half but Ulster flyer Stockdale went over twice in the first half, the second on the stroke of halftime as Ireland went in 14-3 ahead. Scrum half Conor Murray wriggled over early in the second half to widen Ireland's advantage but it was replacement Sean Cronin's try in the 68th minute that could prove a title winner. It earned Ireland a bonus point which means England must beat France, and score a four-try bonus point, in Paris later on Saturday to keep the title race alive. Scotland showed glimpses of the form that saw them beat England in the previous round of matches, with Blair Kinghorn's try keeping them just about in the hunt, but a lack of accuracy at crucial moments proved costly.